No lead or mercury, no radiation, no irritating substance, 100% eco-friendly. Qualified FPC circuit board and LEDs, the strip has excellent heat dissipation. Qualified FPC circuit board and LEDs, the strip has excellent heat dissipation, making it much more durable. 4 Keys IR Remote Controller Power Adapter IR Receiver included, no need to buy extra accessories. Self-adhesive back tape allows an easy application for any clean, dry and flat surface. Waterproof light strip is not only for indoor use, but also suits for outdoor decoration, you can use them on kitchen, under cabinet, dining room, bedroom, party, patio, automobile, wedding etc. 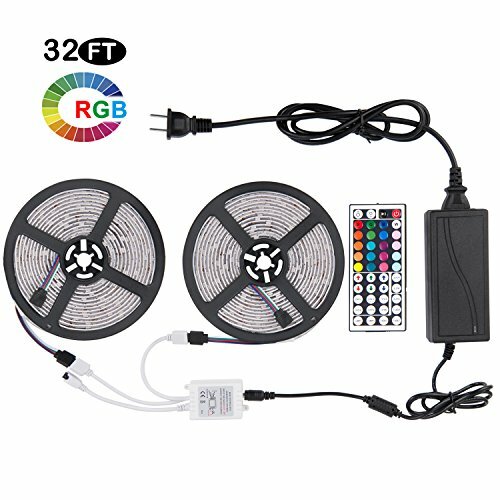 Perfect Light Decoration 32.2ft 300 LED strip light offers enough brightness. 20 lighting colors, 8 dynamic modes and 8-level brightness control available creates colorful, dream-like and romantic atmosphere. Waterproof & Cuttable IP65 waterproof fits for outside use. Every 3 LED strip can be cut without hurting the rest. The flexible PCB strip allows making into any pattern; Low-heat & low voltage, touchable for children. Simple to Install & Use Plug and play. The light strip can be easily installed on any clean, dry and smooth surface with the self-adhesive. Freely change the color effect with the 44-key controller. Fit For Many Occasions Ideal for decorating the kitchen, under cabinet, dining room, bedroom, party, stairway, wedding, birthday, festival or more occasions, making her memorize the very special day. 12-Month Warranty We offer every customer ONE YEAR replacement and refund warranty. For any questions or quality problems just email to us, we will solve the problems within 24 hours. If you have any questions about this product by Cynkie, contact us by completing and submitting the form below. If you are looking for a specif part number, please include it with your message.